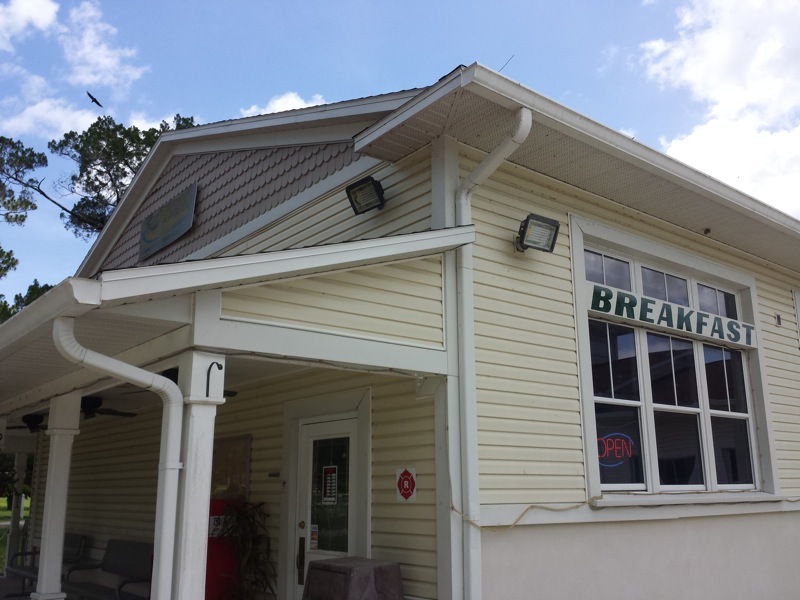 I had breakfast at a restaurant in Lake Helen called Creative Arts Cafe. The building was apparently some kind of youth art/theater school at some point, but was converted into a restaurant when that wasn't successful. I had the Ultimate Greek Breakfast. 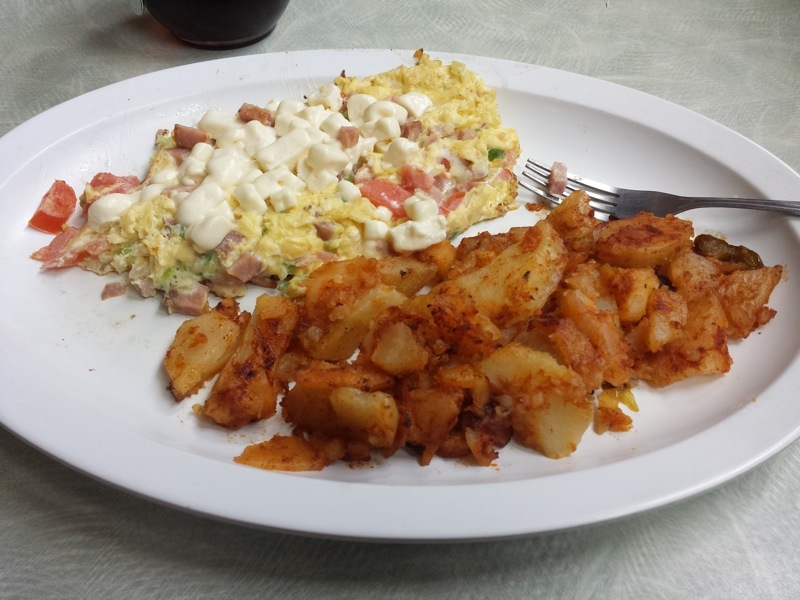 It was scrambled eggs with ham, feta, tomatoes, and peppers. It was pretty tasty, although the cubes of feta on top of the eggs were half melted and had a very non-feta look to them. Hashed browns were served on as a side. They looked well seasoned but needed salt. My food at Creative Arts Cafe was good enough. Not the best breakfast I've ever had, nor was it the worst. 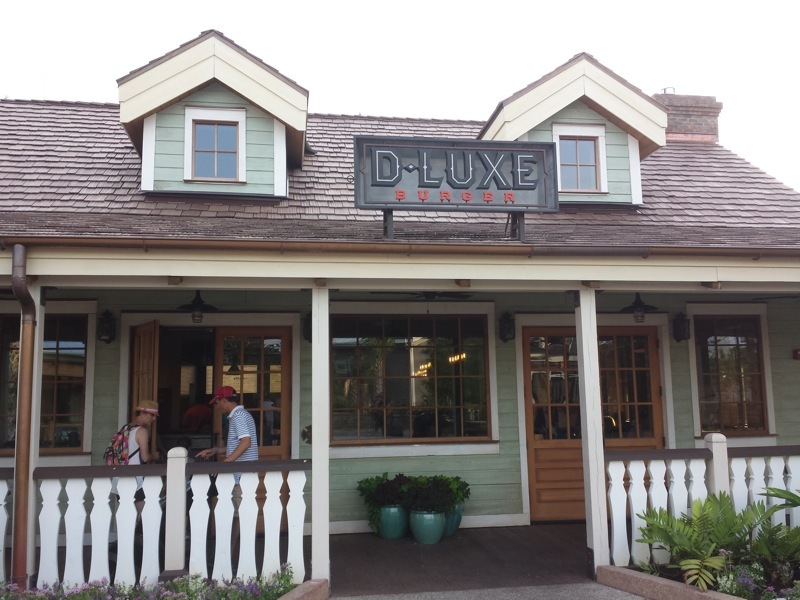 D-Luxe Burger is one of the restaurants which recently opened in the new Town Center section of Disney Springs. 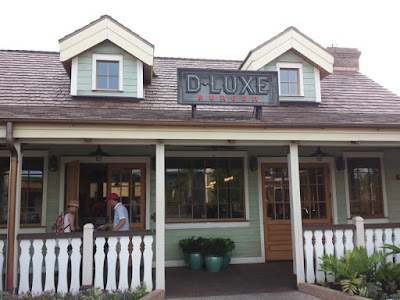 The restaurant's theming was seemed to be modeled off a Florida cattle ranch, located alongside the new spring that has suddenly started to bubble up in what used to be a Downtown Disney parking lot. The menu reminded me of a Shake Shack or a BurgerFi in both format and choices. I ordered the El Diablo Burger. The menu described this as a chorizo-and-signature blend patty, fried banana peppers, pepper jack cheese, lettuce, tomato, and chipotle mayonnaise. A small box of fries was also ordered. 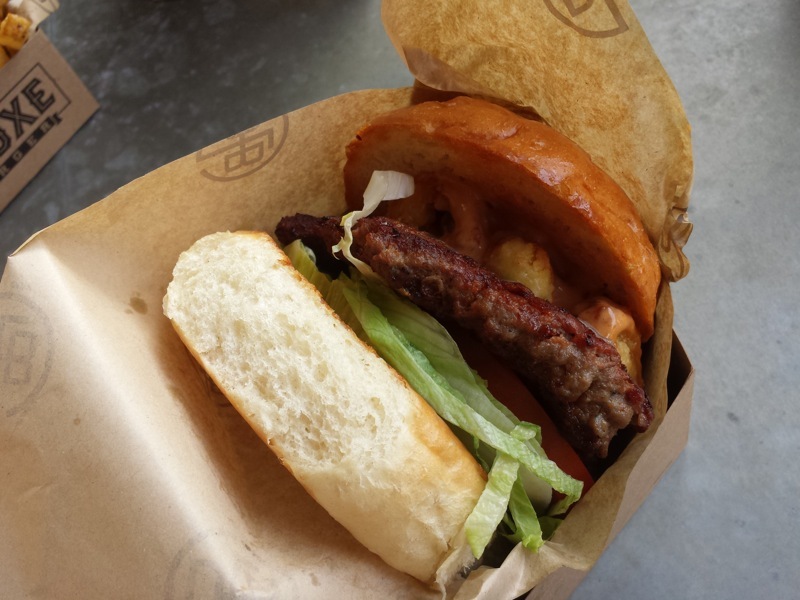 The chorizo did add a bit more flavor that isn't generally found in a plain beef burger. The meat itself didn't provide much spice, nor did the fried peppers, but the chipotle mayonnaise did have a nice kick. The main issue I had was with the burgers being served vertically. Gravity pulled all of the sauce down. This resulted in a sandwich where the top end was dry and bland. The bottom end had plenty of the tasty sauce, but was also really soggy with all the sauce pooling downwards. 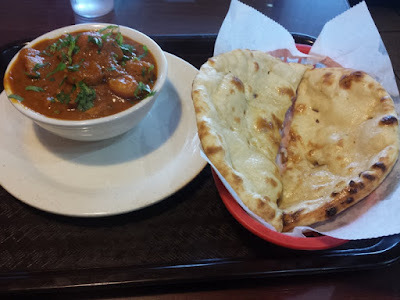 I recently discovered an Indian fast food/take out restaurant in Orlando at the intersection of Conroy and Kirkman called Indian Hut. Indian food after lunch buffets are finished for the day gets pricy in Orlando, so Indian Hut's affordable prices were refreshing. The place is set up similar to a Chinese take-out where you order at a counter then find a table to eat. Better than most take out places, they serve the food here on real plates. I tried the Chicken Vindaloo on my first visit with a side of naan. Pretty tasty. The vindaloo wasn't as spicy as I've had elsewhere, but was just about right for my tastes. 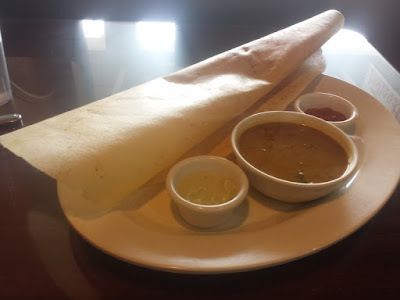 I had the Masala Dosa on another visit. This huge pancake was filled with a potato filling, served with three different sauces. I have enjoyed my visits to Indian Hut so far and I'll most likely return again. Fast food Indian food is a good thing! On the June 2nd, 2016 I got to go to a special Dunkin’ Donuts tasting event. It was the day before National Donut Day! 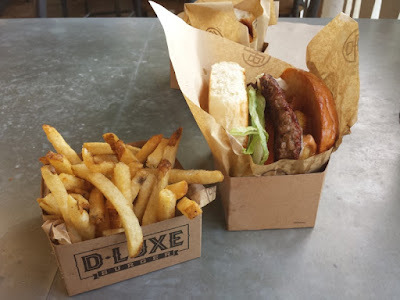 I sampled their newest breakfast sandwiches, coffees, teas, Coolattas, and of course Donuts! The Heath Bar iced coffee, the Sweet Black Pepper Bacon Sandwich and the Blueberry Cobbler Croissant Donut were my favorites! The Sweet Black Pepper Bacon Sandwich had an amazing blend of sweet and peppery. I’m usually not a fan of croissant sandwiches but this was still very good. I also learned that you can get your sandwiches put on any kind of bagels, pastries or donuts! I am a huge regular coffee fan. I was a little skeptical with the Almond Joy and Heath bar iced coffee, but both were good. The Heath bar was something I enjoyed more. It had a mocha coffee taste. The Caramel Latte Square and Blueberry Croissant are the new donuts in town. Both were very good. The Caramel Latte Square was infused with real coffee. Dunkin’ Donuts Croissant donuts are my go to donut from Dunkin’. It has 24 layers and is so fluffy and moist. Dunkin’ Donuts newest Coolatta flavors include Sour Apple, Blue Raspberry, and Watermelon. These drinks are popular with Millennials. These were a little too sweet for my tastes. After all the tasting was done. We made Munchkin Trifles! We layered Dunkin’ Donuts Chocolate Munchkins, whipped cream, candy, and chocolate pudding! This would be fun to make at a kids party! Overall, I am totally a fan of Dunkin’ Donuts. They have something for any taste palette to enjoy whether you are coffee drinker or not! ]I am all about fitness and finding balance of living a healthy lifestyle and loving sweet foods! You can follow me on Instagram: Sienafit. I am writing a guest blog post for Watch Me Eat!